Update: SilentRane has closed, and the region is now privately held. SLurls have therefore been removed from this article. A bell chimes forlornly against the susurration of tide over shingles and the steady beat-like passage of the wind. More distantly, an owl can be heard hooting softly, as if worried by the darkening skies, while the squeal of rodents perhaps put the teeth on edge. On the high wooden deck, its planks aged, weathered and broken, oil can bonfires add their own basso voices to the air, while a conspiracy of ravens circles ominously overhead, perhaps eyeing the wreckage around the deck and its steps suspiciously. Such is the greeting for visitors to SilentRane, the atmospheric Homestead region designed by region holder Quinn Holsworthy (Zoey Drammond) and Bailey Button Rowman (Bailey Delwood) and presented as an “apocalyptic” setting. It’s not clear what may have happened but there is absolutely no denying the “creepy” and “Halloween” epithets appended to the region’s description are deserved, and the general state of the place does suggest some kind of event has overcome it. From the landing point, a raised wooden deck extends a finger out over the water and forms the bar of a shallow “T”, thanks to a short length of deck reaching for the land. Waves break against rocks and the tide clashes with itself as it rolls both towards and away from the coast. Stepping down onto the railed board walk reveals the landing point and its derelict junk – which includes the wreck of an aeroplane lying in the water – is in fact located on a small off-shore knuckles of rock, a place suggestive of having once been a venue for entertainment. Once on land, the path offers a choice of routes: along a ravaged, broken path where a fire burns between a tall cement wall and a tired fence, or under a rocky arch and up into the wilds beyond, where the hooting of the owl is even louder and the sound of chimes can be caught in the wind. The lower path leads by way of a tall copse of pine trees to and fishing wharf, suggesting this may once have been a thriving place of commerce. A large warehouse sits on the shore while fishing boats are moored at the wooden piers. However, given the ruined state of the building, and the carcasses of shark and swordfish rotting as they are suspended from lines or lie strewn on decks, it’s not unreasonable to assume this is a place perhaps now all but deserted. A little further around the coast, beyond more trees and a forlorn children’s playground sits a trailer park with suggestions of occupancy. A light burns, vehicles sit parked close to trailers and a flag flies from a pole. Closer inspection, however, reveals it as a place also long-deserted, the vehicles battered and bruised and nature starting to claim occupancy of the trailers and ground. Set beneath an ideal windlight with the off-sim shadows of mountains suggesting this could be a place sitting on a lake in the wilds, SilentRane is hauntingly ethereal and wonderfully photogenic. A Flickr group is available to those who wish to share images of their time visiting, and should you enjoy yours, please consider a donation at the landing point so that others may also continue to enjoy SilentRane. Current Release version 5.1.9.519298, dated September 5th, promoted September 26th. Formerly the Rakomelo Maintenance RC viewer – NEW. Estate Access Management (EAM) RC viewer, version 5.2.0.520057, released on September 28th. Spotykach Maintenance RC viewer, version 5.1.10.520059, released on September 28th. Black Dragon viewer updated to version 3.3.0 on September 29th – release notes. Cool VL viewer Stable Branch updated to version 1.26.22.20 on September 29th – release notes. Alphalune Creations Gallerie opened its doors to the public on September 29th as the new home for the art of Barry Richez. A long-time resident of Second Life, Barry is well-known for both his 2D and 3D art and his forward, future-thinking outlook. The new gallery space combines all of these in an environment that reflects Barry’s futuristic outlook and offers a unique setting for both his 3D and 3D artwork. Located in the sky, the gallery is a place of two halves. Contained within a skybox with a cityscape backdrop that suggests it exists within a modern setting, it offers a central arrival point bordered by the gallery buildings proper: primarily 2D art to one side, and primarily 3D sculptures on the other, each unit comprising multiple levels. The 2D gallery presents Barry’s digital paintings, beautiful fractal pieces so intricate in form and design, they might so easily be mistaken for photographs of physical 3D objects presented against velvet backdrops. Others appear more abstract in nature, swirls and dishes, curls and splashes; images that through their very abstract form are suggestive of dense nebulae – albeit, perhaps, without the familiar depth of colour as the pieces here tend to focus on fairly fixed palettes, although this in no way detracts from their beauty. The 3D section offers a rich mix of Barry’s sculptures, most with its own story to tell. Movement between the levels is achieved by teleport disks (the 2D gallery space offering stairs as well), and the art structured in such a way that some levels are almost a mini-gallery of itself – particularly where the 3D work shares space with more of Barry’s fractal images. At the same time, one of the levels forms an installation in is own right, a rich blending of colour and animated pieces surrounding a sculpture Barry first presented at the University of Western Australia in Second Life. In this latter regard, the gallery also offers a mini-retrospective of Barry work: those familiar with his past presentations will doubtless recognise some of the sculptures and designs presented here. Considered, balanced and visually captivating, Alphalune Creations Gallerie offers the perfect insight into the art of Barry Richez, and should be a destination for all lovers of art in Second Life. On September 28th, 2018, NASA issued its latest report on how it hopes to return humans to the Moon and then travel onwards to Mars. Entitled the National Space Exploration Campaign Report, it’s a bit of a curate’s egg of things; just 21 pages in length, it offers a lot of aspiration, not always with underlying detail; avoids hard decisions while offering open-ended time lines; presents time lines as a road map, but avoids mention of precisely how to reach the destination(s) or the cost of the journey(s). 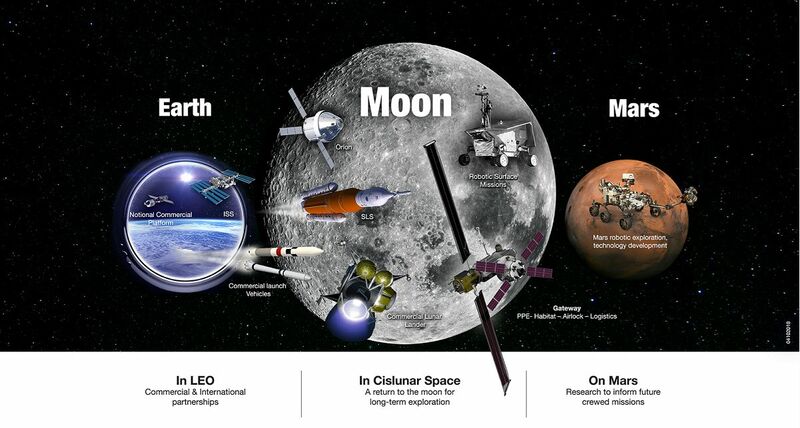 In all, the report lays out three broad aims: expanding low Earth orbit activities to include commercial operators, operating their own orbital facilities – and possibly the International Space Station; moving outwards to lunar orbit and from there to the surface of the Moon; then moving onwards to Mars. All are painted with very broad brush strokes and leave much unsaid. The lunar aspects of the report, for example, cover the incremental development of the Lunar Orbital Platform-Gateway (LOP-G) and how it could theoretically help develop capabilities that can be used in vehicles intended to carry humans to Mars. 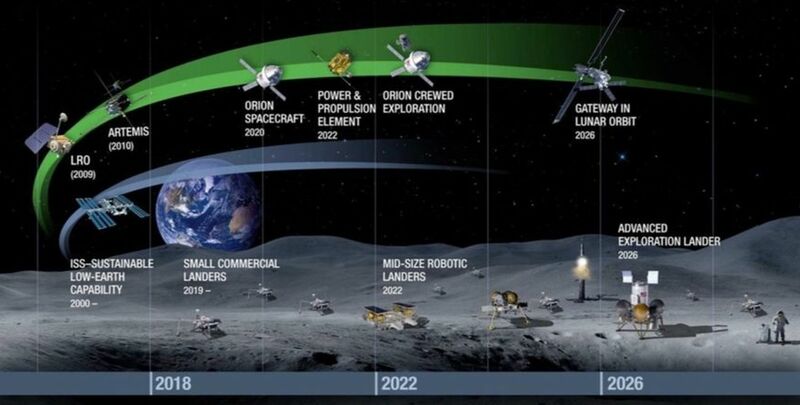 It also outlines how NASA can build towards human operations on the Moon through an incremental development of automated capabilities that both increase our understanding of the Moon, the resources it offers, etc., to a point where the first crew-carrying lander vehicle could be ready “in the late 2020s”. But when it comes to detailed ideas for the architecture of a human presence on the Moon, things are left vague. 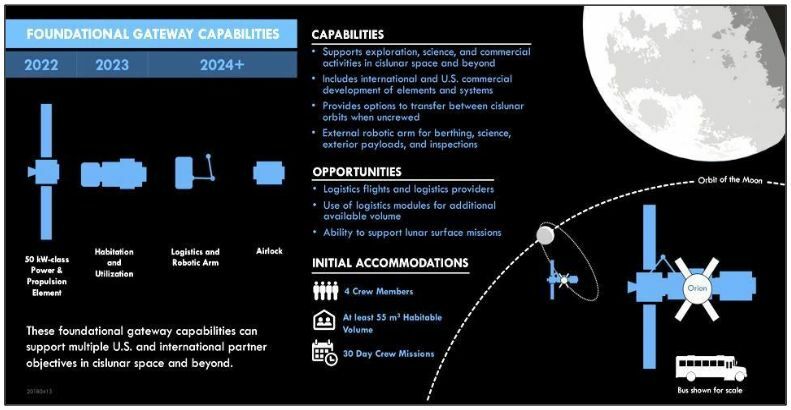 In terms of Earth orbit operations, the report points to NASA transitioning away from operating the International Space Station to leasing facilities from the private sector; but precisely how these commercial orbital platforms are to be built is unclear, other than referencing the US $150 million of NASA’s that will be used to encourage commercial development of such platforms from 2019. $150 million is a very small amount when you consider the $100 billion construction cost of the ISS; without some very clear-cut, real-time ROI being evidenced for the private sector, it’s hard to see the ISS being supported by multiple commercial platforms of equatable capabilities in just six years. To be fair, some of the lack of detail within the report is understandable on a number of levels. In 1989, for example, NASA produced the Space Exploration Initiative (SEI), a report outlining how it would take humans to Earth orbit, thence to the Moon and thence to Mars. The report offered a massive vision: 30 years of development and exploration lading up to humans landing on Mars – as a suitable price tag to go with it: US $430 billion. That’s the kind of figure that would have had Congress dropping the report into the bottom of a very deep draw (possibly in a locked filing cabinet stuck in a disused lavatory with a sign on the door saying Beware of the Leopard, somewhere in the basement of Capitol Hill, if I might re-purpose a quote). There’s also the fact that it’s hard to get any politico to sign up to something that has end results they’re unlikely to be in office long enough to see. This was certainly the case with SEI, and it was something John F. Kennedy understood when he set NASA the goal of “landing a man on the Moon and returning him safely to the Earth” within a decade. Thus, it is perhaps understandable why this report doesn’t stray that far beyond 2024, preferring to leave matters after that date pretty much as “TBD”. However, in the course of the last few years, NASA has been repeatedly criticised by the US Congress for refusing to present specifics when outlining its intentions. In this respect, the pendulum seems to have swung too far: from a gung-ho attitude of “gives us the money and we’ll deliver – although it could take longer than you’ll be around” evidenced with SEI, to an almost timid, “We’d like to do this, but we’ll sort out how later, so you don’t have to worry about the price”, which is perhaps as equally as dangerous when trying to set out where you’d like to go and how you’d like to get there. In my previous Space Sunday update, I covered the arrival of two small Japanese landers on the surface of asteroid 162173 Ryugu. Since then, both of these little vehicles have been returning images and data as they sit on the asteroid’s surface and / or hop around it. While the rovers – MINERVA-II1 A and B – have both revealed the surface of Ryugu to be rocky, the images are still stunning, especially those stitched together to form a time-lapse video showing the Sun passing across the sky above rover 1 B as the asteroid tumbles along its orbit. The rovers are two of four vehicles that will be delivered to the surface of Ryugu by Japan’s Hayabusha 2 satellite, currently orbiting the asteroid. Together the rovers and orbiter will probe and study Ryugu in detail, with the orbiter also gathering samples from both the surface and sub-surface, which it will return to Earth for analysis at the end of 2020.